We never thought that organizing an event for a hundred people and inviting six or seven presentators would be so much work. Since this was our first meeting as a User Group and we did not have any experience, we had some doubts. We definitely learned a lot, but more importantly we did not fail with this one. Our UG is still in child's shoes. 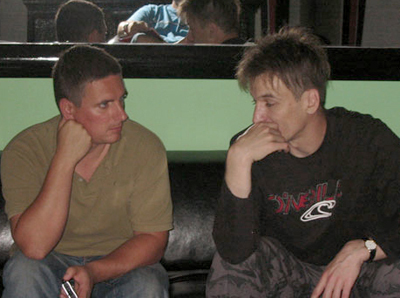 We are only a few months old organization with three cofounders (one from Hungary, one from Belgium and the other from Russia) and besides setting up the website and posting news and tutorials we did not do much. So pretty soon we thought it was about time to meet our members and really do something for them. Naturally there are conferences and meetings in Hungary especially in the summer, but not particularly about Macintosh and not at all about Final Cut Pro. There are thousands of people using this software and there are buddies who share enthusiastically the passion of editing on the Mac with each other, but what was missing was actually bringing all these people together into one community. 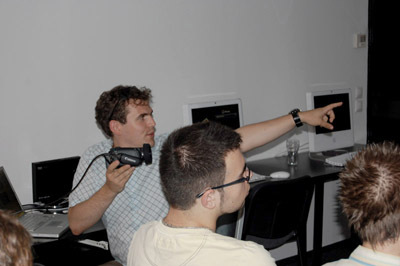 That's why it was a really good idea that we formed the first Final Cut Pro UG in Eastern Europe. We felt from the start that there would be something good coming out of this. We knew people were watching and waiting. And we were right...the first meeting (we call it a Road Show, although it is really just a one-day seminar) was a success. We had seven speakers and almost one hundred online registrations. 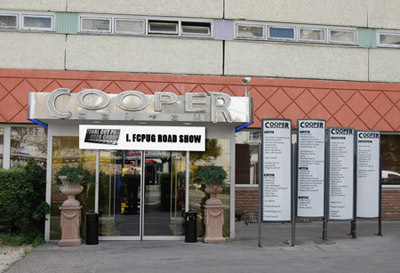 The conference started at around 2 pm in downtown Budapest in an office building named the Cooper Building. It has a big conference room and a bunch of iMacs. All this was provided to us by an old contact of ours, Gabor Ferenczy from MacAcademia (these guys are organizing small courses in this building for all types of Mac software, Final Cut Pro included. Although they don’t provide Certification yet). We were very lucky that they supported us with the place, leaving we, the three cofounders, to deal “only” with printing promotional materials, making badges, contacting, inviting speakers, setting up online registration and getting a visa for our Russian speaker. That was enough of a headache. By the time of the Road Show, all things were ready and we just had to wait for the guests to arrive. Which they did. One by one, they all started to come, and by the start the room was full and our president Mihaly Arva could introduce our first speaker, Vincent Tambou from Apple Europe (France). Interestingly enough they had a three-day seminar (Tech Series), organized by Apcom (the representative of Apple in Hungary) and when they heard about our Road Show they thought they would stop by and give us a short presentation. Of course we were more than happy to offer Mr. Tambou a chance to say a few words as our first guest - which turned out to be a 20 minute speech. He talked about FCS and the Final Cut Server and about Apple in general. We thought it would be better if Mr. Viktorov spoke Russian for a smoother presentation since his English was not that fluent. This presentation however lasted almost 2 hours. The first hour Vadmin talked in general about how to use the Final Cut Server software to improve workflow tasks. The second part of his speech was a live demo using his Mac Book Pro as the server and 4 other iMac's as clients. After this heavy and long (in a positive sense) presentation it was time to refresh ourselves with a speech from the very creative independent filmmaker and 3D animator, Peter Szalkai. (Systron Digital Pictures) Peter showed us how he started in the analogue world in the 80's, later entering the era of the digital world using the same creative ideas and low budget solutions, while producing such results that he is now working for several American and Western European clients mostly in post production and 3D animation. 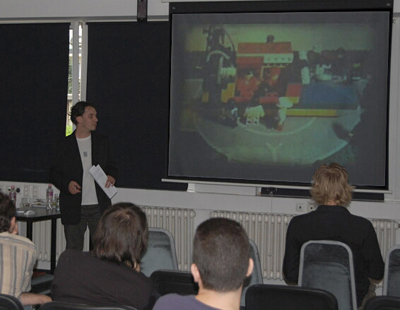 In this presentation he talked mainly about greenscreen/bluebox solutions and how useful it can be, especially when we need a background of an American train station from the 1950's or a sci-fi environment to place our actors in. His speech was followed by a load applause. 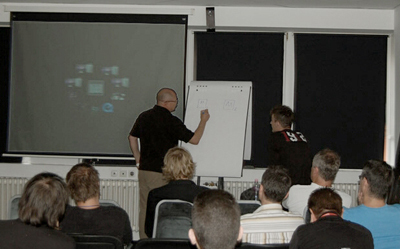 After Peter we watched several solutions and demos from Arthur Kulcsar, who was from Adobe Hungary. Arthur started up with an XML integration demo between Final Cut Pro and After Effects, then he talked about Mocha (did a quick tracking) and finally he did some animation in Photoshop CS4. He also talked in general about the different software applications in the CS4 package. After almost an hour he said he could talk all day about this, but unfortunately time was running out. After the Adobe presentation, it was time for something different, something technical. 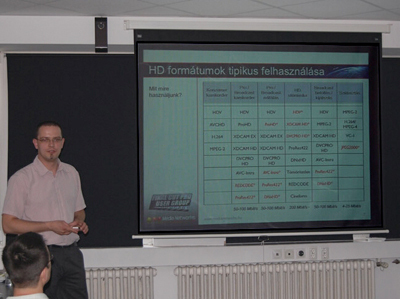 Jozsef Pinter from MediaNetworks, had a really interesting presentation about HD. At the beginning of his speech we were all sure we knew everything about HD, but as he dug deeper into codecs and compatibility issues, suddenly all got very confusing (at least for me). Later, he proceeded to explain which are the best choices for different types of productions, what codecs to use and how to convert among different resolutions without loosing quality. So basically what he was talking about was how to end up with the best output format for the client without quality loss during the production. (Later on he also sent us his presentation slides, which we posted on our site, (unfortunately it is in Hungarian) but for us here is really helpful. So this is how our first Road Show ended and can say it was a success. We even stayed there a few hours longer after the show. We made two video interviews: one with the famous actor, Otto Kinizsi (he showed up in the middle of the Road Show and turned out to be a Final Cut Pro fanatic) and the other, Vadim Viktorov, the Mentor Trainer from Moscow. Since one of them answers in Hungarian and the other one in Russian we will need some post work on this, but we will try to put together a 5 minutes flash film somehow. And of course, for those missed the event, we recorded all the show in HD, which will be available soon from our Online Shop - if we find the material usable. In the meantime we have started to organize our second Road Show, with well-known personalities from the world of editing and film from the States and Europe as well. The date for this event is not fixed yet. We are also negotiating with sponsors and trying to involve other software and hardware companies to participate in all this. Maybe we can connect the meeting with some exhibition that attracts more people and make the show even better and more interesting. And since the presentators on our next show will be mainly English speakers, you are all welcome to join us in Budapest. We will keep Twittering about it.